Wednesday was a blast getting together with about 40 other photographers in San Francisco at the Palace of Fine Arts. (the above shot is an abstract of the dome of the Palace reflected in the pool that borders the Palace). It was the monthly meetup for the San Francisco Photography Meetup Group. We had a great time shooting around the palace at sunset and into the night. 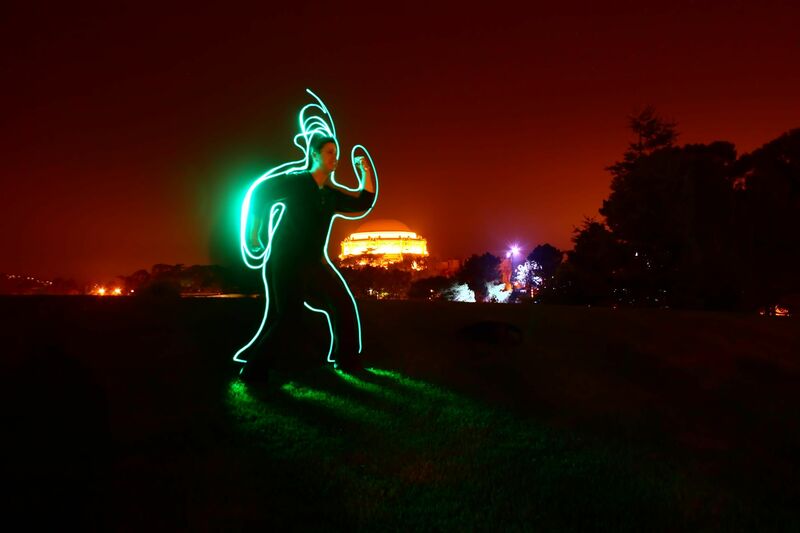 A smaller group also went next door to the Letterman Digital Arts Center and practiced some light painting. This shot was one I took of the group as someone was being painted with a green light. You can see other of mine from the shoot at my website (everything from the photo displayed to the end of the portfolio are from the shoot). You can see other photographer’s photos at the group’s Meetup site, from the sites of attending photographers via the events discussion board, as well as on Zooomr via Thomas Hawk’s blog.